I'm unsure why one trifling incident this afternoon has moved me to write to you. But since we've been separated, I may most miss coming home to deliver the narrative curiosities of my day, the way a cat might lay mice at your feet: the small, humbling offerings that couples proffer after foraging in separate backyards. Were you still installed in my kitchen, slathering crunchy peanut butter on Branola though it was almost time for dinner, I'd no sooner have to put down the bags, one leaking a clear viscous drool, than this little story would come tumbling out, even before I chided that we're having pasta tonight so would you please not eat that whole sandwich. Eva never really wanted to be a mother - and certainly not the mother of a boy who ends up murdering seven of his fellow high school students, a cafeteria worker, and a much-adored teacher who tried to befriend him, all two days before his 16th birthday. Now, two years later, it is time for her to come to terms with marriage, career, family, parenthood, and Kevin's horrific rampage, in a series of startlingly direct correspondences with her estranged husband, Franklin. Uneasy with the sacrifices and social demotion of motherhood from the start, Eva fears that her alarming dislike for her own son may be responsible for driving him so nihilistically off the rails. After listening to William Landy's Defending Jacob and reading Jodi Picoult's Nineteen Minutes, I hoped I would get to Lionel Shriver's We Need to Talk About Kevin before the end of the year. When a couple of ladies in one of my online reading groups mentioned doing a group read of the book, I jumped at the opportunity. Unfortunately, it didn't turn out to be much of a group read. Only one other person read the book, and she read it much quicker than I did. By the time I finished, she had moved on to other things. We Need to Talk About Kevin is not only a well written book that makes one think, it is also a book that draws the reader in affects him or her (at least me) on a more visceral level. This is a book that is an experience rather than just another book to be read. When reading a book, it isn't unusual for me to draw comparisons between my life and that of the characters I am reading about. I not only ask what I would do in a similar or the same situation, but I also think of how similar or dissimilar I think or behave from the characters I am reading about. It's not something I put much effort into; rather, it's just the type of reader I am. Call it reflection, internalization, personalization or what have you. It's both a blessing and a curse. Especially when I read a book like this. Being still newish to parenting and one who recently suffered from Postpartum Depression, I'm most susceptible to anything related to parenting and parenting issues. Anyway, listening to We Need to Talk About Kevin, particularly the very early letters, I found myself wondering about my own reasons to have a child. My own ambiguity about having a child before my husband and I decided we wanted a child. Eva and I were in totally different places when we got pregnant though. Her situation just makes me sad. Not wanting a child, but having one because she thinks it will make her husband happy. I feel sorry for Eva mostly. I think she did what she could with what she knew. She tried. But I also am getting the distinct impression that she never really wanted Kevin even after he was born. He was a very difficult child. Colicky, perhaps? How much of Eva's observations of Kevin as a young child are to be believed? Is she a reliable narrator? What I see is the lack of attachment between a child and his mother--and even the father. As much as Eva says Franklin is on Kevin's side, Franklin was always absent early on and his denial and belief that his son was an ideal and not the reality, did not help. I am not blaming Eva or Franklin for what Kevin did, but I do think, from a clinical standpoint, something didn't click for Kevin during those early, vital formative years. Maybe even before that really. I believe a baby, even from the womb, can sense certain things. So I tend to think his mother and father's detachment were contributing factors. But I think he was already "off" somehow when he was born. I really liked the book. I can't say I was surprised by how things unfolded as I had a strong sense how everything would play out from the beginning. Still, I loved the author's writing and the way she really brought out the characters, especially Eva. Reading her story brought to mind William Landay's Defending Jacob. It's from a father's perspective of a son who is accused of murdering a classmate. It's less "in the head" as compared to Shriver's book--more a thriller, I think, than Shriver's book, which I see more as literary fiction. The book was much easier for me to read after the first half, I'll admit. Once I was able to get out of my own head and just focus on Eva's situation. This book is certainly thought provoking. The idea of nurture versus nature comes to mind. And I especially like the fact that it is written from the perspective of a parent. All too often we, as a society, are quick to blame the parents when a child acts out like Kevin did. I think it's a natural process in our attempt to understand the "why" of it. Eva wasn't a character I particularly liked, and I doubt we ever would have been friends had she been real and we met in real life, but I felt for her as a parent and as a woman. I understand Eva's feelings of guilt. I think in her shoes, I would feel the same way. It's easy to look back and think of all that should have been done, the interventions that might have helped prevent such a horrible act from occurring. And it's easy to think--or say--we would do things differently in the same situation. I came away from this book shaking my head. I really don't know. It's a book that makes me sad mostly. Sad for Eva. Sad for all those families who lost loved ones. As for Kevin, I have no sympathy for him. Maybe for that little boy he once was, but what he did was plain evil. Coleen Marlo narrated the audio production of the book and I have to say I have a hard time separating her from the story, given how much her voice became and was Eva for me. She did an amazing job. 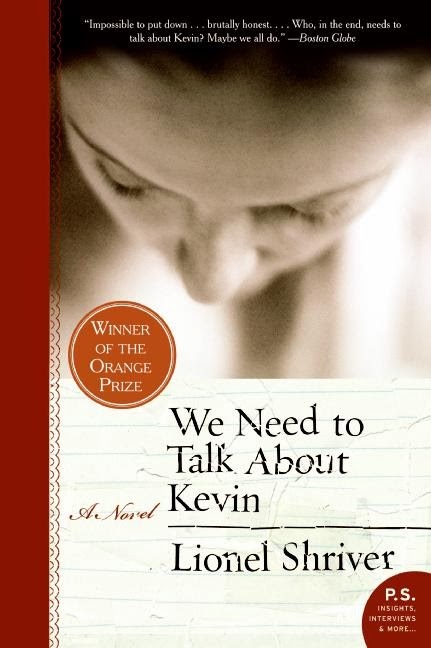 Thanks to her and the author, We Need to Talk About Kevin is a book I won't soon forget. You can learn more about Lionel Shriver and her books on the author's Facebook Page. For more information about the narrator, Coleen Marlo, visit her blog. This one took me awhile to get through. I think what was most disturbing is that even though Eva was the furthest thing from maternal, some of her inner thoughts and musings could have come from any mother. Everyone experiences doubts. And Shriver is an incredible writer...just whip sharp. You should try to see the movie. Sandy - I saw the movie soon after reading the book. The acting was great on all accounts, but I didn't care for the movie itself. This is one of my favourite books so it is great to see that you found it so thought provoking. I read it years ago, but still remember almost everything about it. I now just have to hope that I don't ever find myself in Eva's situation. Jackie - This is not a book I will soon forget. Like you, I hope I never end up in her situation either. Wendy, I thought the audio was awesome as well. What a story - disturbing, yet wonderful. Diane - Yes, exactly. It was so well done. I really like books like this, but I am not sure I could take a steady diet of them. A book I've had on my TBR pile for longer than I care to think. For some reason I keep picking it up only to put it back down again but Inspired by your review I think I'll give it a go - no excuses. Tracy - I kept putting off reading this one too. I have had a print copy for years, but decided the only way I could fit it in now was via audio. I may eventually go back and read the print version. I listened to this one and was upset with Eva and Franklin in turn but I'm not sure they could have done anything. This book begs to be discussed so I'm going to suggest my book club read it for January and then come to my house to watch the movie, which I haven't seen yet. Kathy - I am not sure they could have done anything either. It's easy to look back and think what might have been done differently, but when you are in that situation, it's much harder to navigate. I don't think Eva or Franklin could have seen coming what Kevin did. Your idea for your book club sounds like a great idea, Kathy. Jenclair - I know what you mean. I am not sure I read either book at necessarily the "right" time for me, but given how much I still liked both, I suppose it could be argued that I did. These are both books that are best taken in when you are ready for them. Yes, it was disappointing things didn't work out with the reading group. It seems to happen a lot with me and group/buddy reads. This really is a book that makes you think. It took me about 100 pages to get involved in the story, but from there, it was just...wow. Anna - It is extremely thought provoking. Even though I think it was a bit harder, I am glad I chose to read it now, after becoming a parent than before. Not that those without children can't get the full experience of the book, only that the experience is slightly different. I read this one in print, but I can imagine it would be very powerful with a good narrator. Carrie - Coleen Marlo was amazing. I hadn't heard of her before (but that isn't saying much given how new to audio books I am). I would highly recommend this audio version. I felt like I had gotten punched in the gut when I finished this one. I STILL have people commenting on the review and it posted in May 2012. My mind was all over the place and I still think about the book a lot. If you are up to it, stop by to read some of the comments. They were so thought provoking. Ti - Thank you for discussion link! I will check it out when I have more time. This book definitely was like a bunch in the gut. I'm still thinking about it, and it's been quite a while since I listened to it. I always say reading this book is like talking off a bandage. Some people yank it off quickly, some (like me) have to peel it off slowly. I had the same reaction as Ti, like I got punched in the gut. There were reveals toward the end that I did not see coming either, which just took my breath away. I've read two of Shriver's books since this one and I keep waiting for the same reaction. This really is an amazing book. Lisa - That is a good analogy. :-) I definitely am more of a peeler. I admit I'm afraid to try something else by her. I worry I will except the same caliber and will be disappointed. I've not actually read much about this book though from what I had read I thought the topic was different - what you've written here is something I wouldn't mind reading. So I've nothing about the plot to say but I do like how you included your thoughts, it gives a real idea of what to expect. Charlie - Just about everyone I know who has read this one loved it, so I couldn't help but know a little about it. I think you would like it. It's a difficult subject matter, but very well told. I hope you do read it as I would love to know what you think. Samantha - I think that was my issue too. It's definitely not an easy read and while I'm not sure I listened to it at the best time for me, I am glad I did just the same.